I bought this first to use to keep my dogs in the kitchen (out of the living room), and now I use it to keep my son in the living room! It was a pain to install, you really need 2 people to put it up. Once it's up, though, it works great! I love it, especially the door. I have used this with both my boys. It's great to be able to make sure they stay were they are supposed to.the gate is easy to Install and store.I love that it fits multiple doorway lengths. Useful and Secure and Not Bad Looking Either! We use two of these gates. In the twins' first home, the gates were connected together to create an enclosed play area in our living room. So much fun! In the twins' new home, the gates have been separated to block them from the office area and the dining room. We love the length of this gate and the swinging door. Durability This gate is pretty durable, although, one of them arrived with the connecting bracket broken. That being said, our now 2 year old twins climb the gates yet they are pretty much still holding up in place. The doors still latch and the netting is still in tact. 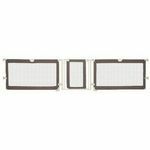 I would suggest that caregivers spend some extra time really securing the screw hole if attaching the gates to a wall. I'm not an expert at how to do this, but what you're looking for is preventing the gate from pulling out of the wall. The fact that ours have done this is the wall's fault and not the gates'. 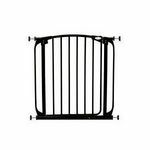 Ease of Use This gate is very easy to install and to bend into the desired configuration. We have used our two gates in two different homes and in two different designs. 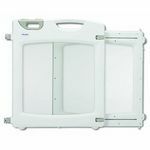 The latch for the door is also easy to open for adults however closing the door make take a little more concentration. Sometimes the top and bottom latches don't line up easily. But don't let this deter you! This is not that big of a deal compared to the good qualities of this gate which among other things include that once in place, the door is quite secure. Safety Though the twins think they can open the door, they cannot as long as it is properly closed. And even though they are able to climb it now at 2 years old, and in spite of the fact that both gates have pulled out of the wall, both gates are still standing. We haven't had any problems with pinched fingers or the gate falling. almost three years ago my husband and i moved into the home we now live in. at the time, our son was about 17 months old. this home has what my brother calls a "death trap" in between the living room and kitchen. a tiny spiral staircase was added to the home after it was built to provide access to the basement , and needless to say there is a big five foot hole in the floor with nothing around it! of course we HAD to buy something to make this childproof so he didn't fall to his death. so we bought this gate and actually only needed 2/3 of it to block the opening on the living room side. i love how it's so adjustable and works with an odd shaped "opening" as this is angled around the stairs. it's VERY secure in how it fastens to the wall, and we've not had any trouble with it getting lose or feeling unsafe in the years of use. our son isn't the type of kid who works hard to get past whatever is used to confine him, so we haven't had trouble with him pulling at the velcro closures on the paneling (which i've read other parents complain about in reviews). 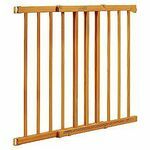 this gate is really quite excellent and if you have a huge or angled opening you need to secure, i HIGHLY recommend it. LOVE THIS THING! 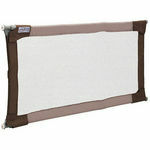 Summer Infant Super Wide Gate is a Life Saver! I have a wide opening (about 6 feet) from my living room to my kitchen. My husband and I had already decided that the family room would be our baby's main play room because it's the only carpeted room on the first floor. So I needed to find a good, sturdy gate to put across the opening.I did a lot of research and read a ton of reviews. I finally settled on the Sure and Secure Super Wide Custom Fit Gate. Most of the reviews about his product were very positive. However, I did read several complaints about the installation of the gate. It does have to be bolted to the doorway and some people said they had trouble getting it secure. Some also complained that the bolt ripped out of the wall making an ugly hole and a useless gate.With the negative reviews in mind I still decided to go with the majority and purchase the gate. I am very happy that I did. I can't say much about the installation because my husband did it. But he did it within an hour and with no curse words! So it couldn't have been that bad.The gate is very sturdy. We have had it up for about a month now. My daughter pulls herself up on it and it feels secure. It's also attractive to look at with the beige and brown colors. I like that it has a mesh panel rather than bars because I know my daughters limbs would be flying through bars.It's a very large gate and totally adjustable. For our opening we only needed to use one panel (it comes with 2) and the gate.My only complaint is that I wish it had a foot pedal to open the gate. The latch is on the top and is easy to use, but when carrying a baby it's just easier to use your foot to open it than your hand. But you can certainly open it with just one hand. Big gate worth the money! We purchased the summer infant sure and secure gate after looking for days on the internet for a very odd opening in our house. We needed a gate to block the stairs, hallway and kitchen from our little girl. This gate works perfect! I love that you can customize the fit of the gate. We actually had a little section leftover to use upstairs to block the stairway. Not only does this gate work great but it looks great too! It's not too bulky looking and has a nice tan color to it. It matches our house perfect! Also something I didn't consider when buying the gate is that it is very soft. My daughter runs into it constiantly (on purpose) and since there is mesh between the top and bottom she just bounces right off. My next favorite thing is that the gate part swings open....both ways! I love that we don't have to climb over it all the time and it is easy to work but my daughter (hopefully) can't figure it out. If you are looking for a big gate that looks great this is the one! 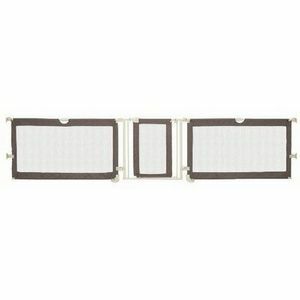 This gate by Summer Infant is a must for large openings!! We just moved into our first home and were looking for a product to fit an odd opening between our living room and dining room. The opening is a little over 8 feet with two support beams in there as well. Searched and finally found this lifesaver!! Had to order online so I anxiously awaited it's arrival. Yesterday the dalivery man showed up and made my day :) Once my 9 month old went down for his afternoon nap, I got to work on installing the gate. Only took about 20 minutes, would have been quicker but my drill was on it's last leg. I am loving this gate! It easily fit my odd opening and could even extend further up to 10 feet if we needed it to. Has a easy access gate in the middle but sturdy enough to hold up to my boys. Love the fact that the gate is made our of fabric and mess rather than hard plastic or wood. Keeps my little guy out from under my feet when I am cooking and away from the dog food. Price was a little steep for what I would like but well worth it. Summer Infant custom gate is a great gate for most babies. The Summer Infant Sure and Secure Custom Fit Gate was the first gate that I bought to block off a part of the house from my baby. I got it when he was 10 months old and it was great for a while. I had several gates in doorways and gates with vertical poles were the first for him to be able to climb. He would wrap his toes around the poles to climb up. The way this gate is made is much better. It is a sturdy mesh that he was not able to climb over. The ability to shape it into any needed position is another plus. It allowed the gate to circle around an old fashioned stair base. The only negative that I found was the sturdiness of the poles. At 18 months old my son was able to push the pole until it snapped off. They look like all metal but they are actually plastic in some parts. For most children this is probably an excellent gate. If you also have a Bamm Bamm I would be aware that no gate is unbreakable. My son broke a metal pole off of a Kidco Hearth gate also.